Until the end ... Now. 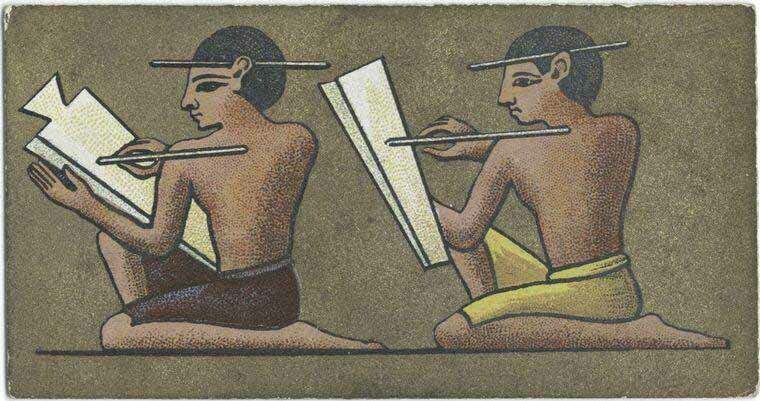 The Ancient Egyptian scribe, or sesh, was a person educated in the arts of writing (using both hieroglyphics and hieratic scripts, and from the second half of the first millennium BCE the demotic script, used as shorthand and for commerce) and dena (arithmetics). Sons of scribes were brought up in the same scribal tradition, sent to school and, upon entering the civil service, inherited their fathers' positions. 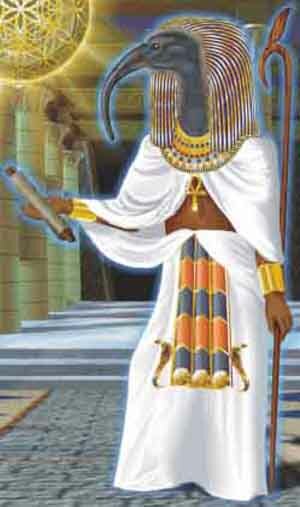 Much of what is known about ancient Egypt is due to the activities of its scribes. Monumental buildings were erected under their supervision, administrative and economic activities were documented by them, and tales from the mouths of Egypt's lower classes or from foreign lands survive thanks to scribes putting them in writing. Scribes were also considered part of the royal court and did not have to pay tax or join the military. 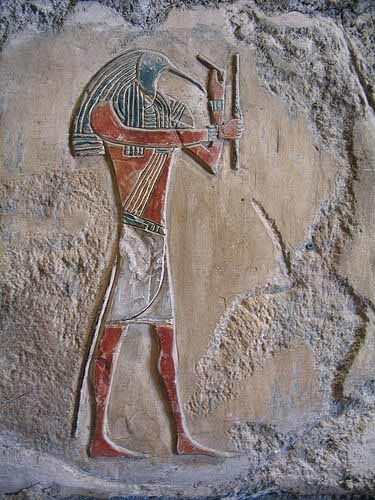 The scribal profession had companion professions, the painters and artisans who decorated reliefs and other relics with scenes, personages, or hieroglyphic text. 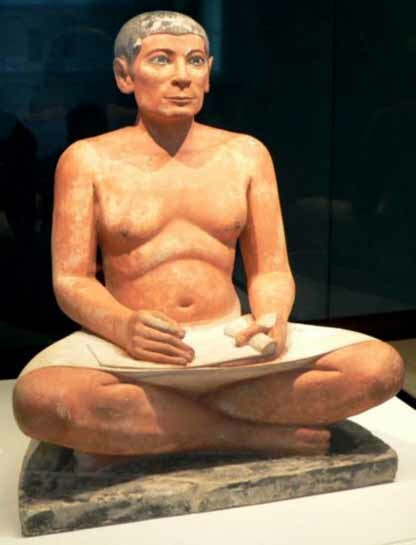 A scribe was exempt from the heavy manual labor required of the lower classes, or corvee labor. A scribe's duties ranged from writing letters for townspeople, to recording harvests, to keeping accounts for the Egyptian army. Above these scribes were more scholarly scribes, who had advanced to higher positions such as priests, doctors, and engineers. Priests were devoted to their religious duties in the temples at least three months out of every year, during which time they never left the temple. At other times the worked as judges and teachers. 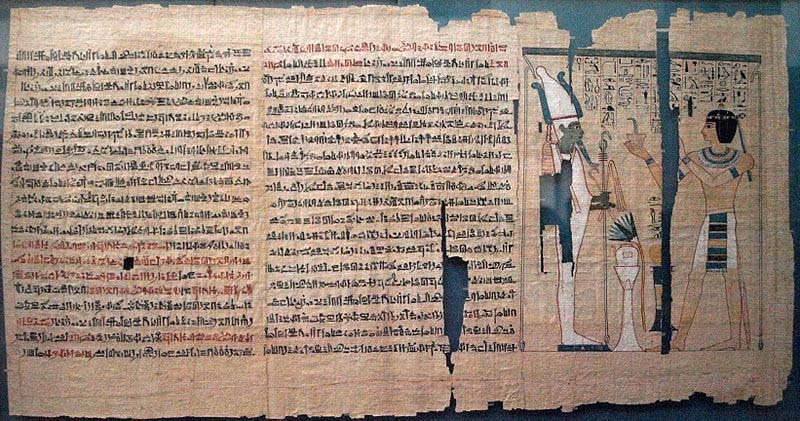 The native writing systems of Ancient Egypt used to record the Egyptian language include both the Egyptian hieroglyphs and Hieratic from Protodynastic times, the 13th century BC cursive variants of the hieroglyphs which became popular, then the latest Demotic script developed from Hieratic, from 3500 BC onward. 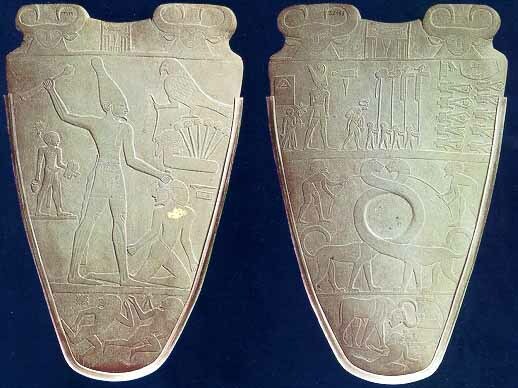 For many years, the earliest known hieroglyphic inscription was the Narmer Palette, found during excavations at Hierakonpolis (modern Kawm al-Ahmar) in the 1890s, which has been dated to c.3200 BC. However recent archaeological findings reveal that symbols on Gerzean pottery, c.4000 BC, resemble the traditional hieroglyph forms. In 1998 a German archeological team under Gunter Dreyer excavating at Abydos (modern Umm el-Qa'ab) uncovered tomb U-j, which belonged to a Predynastic ruler, and they recovered three hundred clay labels inscribed with proto-hieroglyphics dating to the Naqada IIIA period, circa 33rd century BC. Egyptologists refer to Egyptian writing as hieroglyphs, today standing as the world's earliest known writing system. The hieroglyphic script was partly syllabic, partly ideographic. 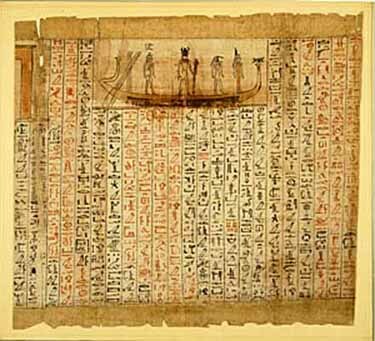 Hieratic is a cursive form of Egyptian hieroglyphs and was first used during the First Dynasty (c. 2925 BC - c. 2775 BC). The term Demotic, in the context of Egypt, came to refer to both the script and the language that followed the Late Ancient Egyptian stage, i.e. from the Nubian 25th dynasty until its marginalization by the Greek Koine in the early centuries AD. Most surviving texts in the Egyptian language are primarily written in the hieroglyphic script. However, in antiquity, the majority of texts were written on perishable papyrus in hieratic and (later) demotic, which are now lost. There was also a form of cursive hieroglyphic script used for religious documents on papyrus, such as the multi-authored Books of the Dead in the Ramesside Period; this script was closer to the stone-carved hieroglyphs, but was not as cursive as hieratic, lacking the wide use of ligatures. 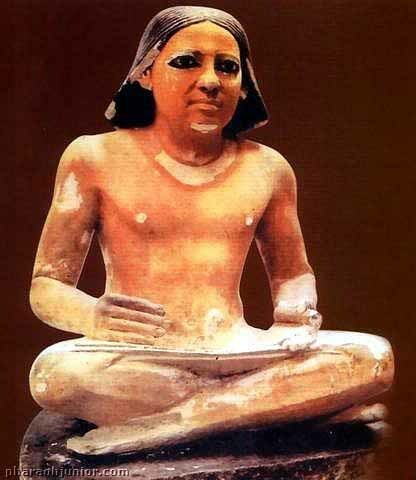 Additionally, there was a variety of stone-cut hieratic known as lapidary hieratic. In the language's final stage of development, the Coptic alphabet replaced the older writing system. 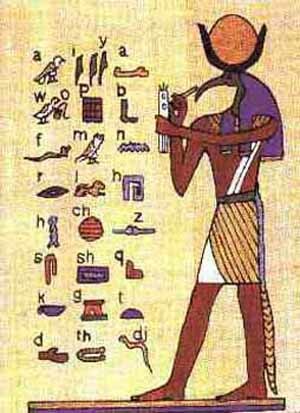 The native name for Egyptian hieroglyphic writing is "writing of the words of god." Hieroglyphs are employed in two ways in Egyptian texts: as ideograms that represent the idea depicted by the pictures; and more commonly as phonograms denoting their phonetic value. For example, the hieroglyph representing the biliteral pr is typically used as an ideogram to denote the word 'house'. In addition, the same glyph is used as a phonogram to write the word pr(y) 'to go out' due to the similarity in pronunciation. To leave no doubt as to which word is actually meant, a vertical stroke is drawn underneath the glyph to mean 'house', whereas a pair of walking legs is added next to the same glyph to clarify that pr(y) 'go out' is meant instead. To further clarify the pronunciation, the hieroglyph for mouth (ro) is typically added in between the house and the walking legs, so that the whole combination encodes the word pr(y) like this: "Word that sounds like a word for house which ends in an r and is related to walking => to go out". Hieroglyphic writing is thus an intricate mixture of phonetic and semantic components. Apart from hieroglyphs, hieratic (a cursive version of hieroglyphic writing) and demotic (even more cursive and abbreviated) were employed in Egypt's 3,000+-year history of hieroglyphic writing. As Egypt became part of the Greek and (later) the Roman empire, the hieroglyphic writing system was replaced by the Greek alphabet used first to write magical and later Christian manuscripts (Coptic). A few extra characters had to be added to represent sounds of the Egyptian language which did not exist in the Greek pronunciation of the time (e.g., the phoneme /f/). These characters were taken from the demotic script. Most people refer to hieroglyphs when they speak about Egyptian writing. It is a common misconception that the hieroglyphs are pictures that represent ideas instead of the sounds of the language. While the shapes of the hieroglyphs are indeed taken from real (or imaginary) objects, most of them are used for their phonetic value. Take, e.g., the hieroglyph representing a house. It can be used to write the word pr (vowels unknown) which means 'house'. The same hieroglyph is used for the word prj 'to come out' due to the similarity in pronunciation. To leave no doubt as to which word was actually meant, the Egyptian scribe would add a pair of walking legs underneath the house to clarify that prj and not pr was meant here. To further clarify the pronunciation, the hieroglyph for mouth (ro) is typically added in between the house and the walking legs, so that the whole combination encodes the word prj like this: "Word that sounds like a word for house which ends in an r and is related to walking => to come out". Hieroglyphic writing is thus an intricate mixture of phonetic and semantic components. Apart from the hieroglyphs, hieratic (a cursive version of hieroglyphic writing) and demotic (even more cursive and abbreviated) were employed in Egypt's 3,000-year history of hieroglyphic writing. As Egypt became part of the Greek and (later) the Roman empire, the hieroglyphic writing system was replaced by the Greek alphabet used first to write magical and later Christian manuscripts (Coptic). A few extra characters had to be added to represent sounds of the Egyptian language which did not exist in the Greek pronunciation of the time (like, e.g. the "f"). These characters were taken from demotic. Written, cursive hieroglyphic is generally written in columns, top-to-bottom or horizontally, right-to-left. In the latter stages of hieroglyphic cursive the only surviving examples are written horizontally, right-to-left; vertical hieroglyphic should be read from top-to-bottom. 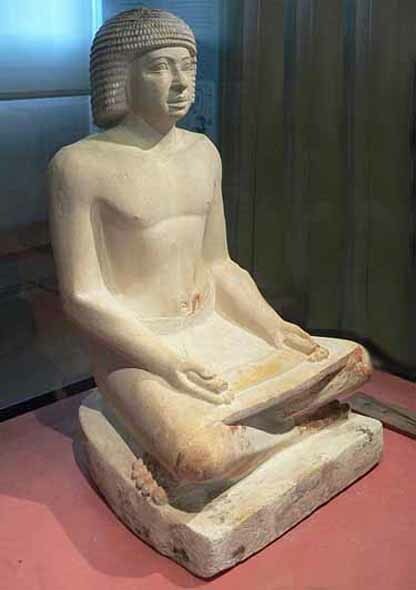 As an example, if a tableau contains a picture of a man seated and facing right, then all the hieroglyphs with a definite front and back would face to the right as well. The actual hieroglyphs would be read from right-to-left because these images almost always face the beginning of the sentence. Hieroglyphic texts that do not display this behaviour are said to be in retrograde. 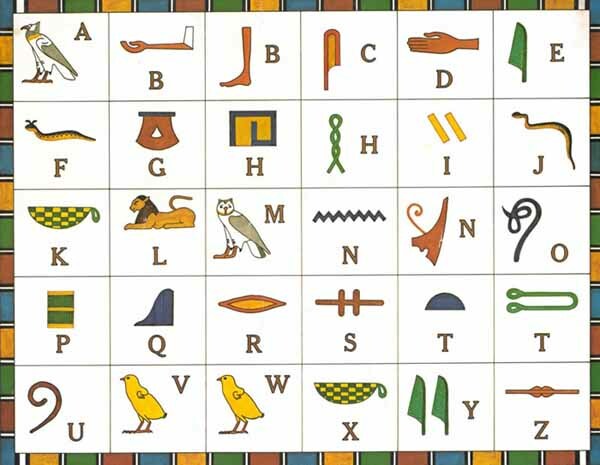 Once one understands hieroglyphic it is easy to determine if one is examining a retrograde text because it will simply make no sense at all!As an aid to reading, and perhaps to the ancient Egyptian's sense of aesthetics, hieroglyphs were also packed together into neat patterns. In general, two or more short or thin (depending on which direction one was writing the hieroglyphs) would be written in the same block as each other. Occasionally, a tall or wide symbol would be made smaller and placed with another short or thin hieroglyph. Until recently, given the time span we are talking about, the decipherment of hieroglyphic was hampered because those attempting to decipher the hieroglyphs assigned emotional meanings to the actual symbols used. 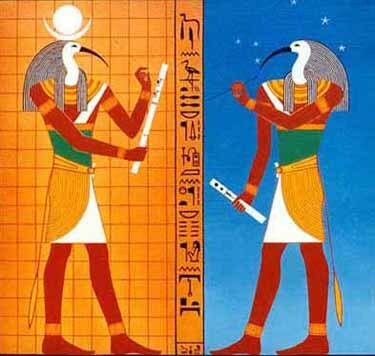 For example, some people believed that the hieroglyph for son, a goose, was chosen because geese love their sons above all other animals. 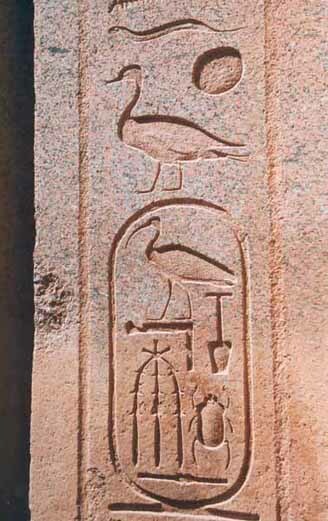 This hieroglyph was chosen, though, simply because the word for goose once had the same sound as the word for son. A further impediment was the lack of complementary material, that is to say material of the same work written in close proximity to another translation. Athanasius Kircher, a student of Coptic, developed the notion that this last stage of Egyptian could be related to the earlier Egyptian stages. 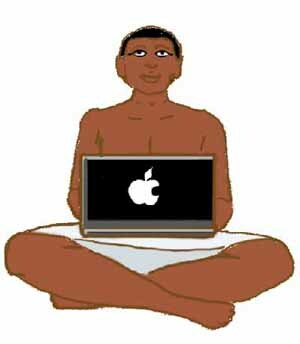 Because he was not able to transliterate or translate hieroglyphic he could not prove this notion. However, in 1799 when the discovery of the Rosetta Stone occurred, scholars finally had an example of hieroglyphic, demotic and Ancient Greek that they were all reasonably certain were the translations of the same passage. In hieroglyphic, the name of the King or Pharaoh and gods' names are often placed within a circle called a cartouche. Jean-Francois Champollion, a young French scholar, demonstrated how the name Cleopatra could be made in hieroglyphic. Furthermore, by using an impressive knowledge of Coptic he surmised that a number of symbols showing everyday objects could be pronounced as in Coptic. Applying this knowledge to other, well-known hieroglyphic sources clearly confirmed Champollion's work and linguistic scholars now had a way to work with and delineate the language into nouns, verbs, prepositions and other grammatical parts. Interest in the ancient Egyptian languages continues. For example, it is still taught in several universities. Many resources are in French or German and not just English so it can be useful to know one of these languages though not a requirement. For the film "Stargate", Egyptologist Stuart Tyson Smith was commissioned to develop a constructed language to simulate the tongue of ancient Egyptians living alone on another planet for millennia. While Egyptian culture is one of the influences of Western civilization, few words of Egyptian origin remain in English. Even those associated with ancient Egypt were usually transmitted in Greek forms.